Dremora are humanoid Daedra aligned with the Daedric Prince Mehrunes Dagon, often very intelligent, and generally hostile. In lore, it is said they can be found in clans of large numbers in the wastes of Oblivion. Dremora are grouped into several different castes: Churl, Caitiff, Kynval, Kynreeve, Kynmarcher, Markynaz, and Valkynaz. 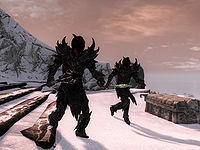 Dremora are a rare sight in Skyrim, only appearing as summoned creatures and in a few set locations, such as the Shrine of Mehrunes Dagon, Shalidor's Maze, and Azura's Star Interior. The Sanguine Rose, a reward from the quest A Night To Remember, will summon a leveled melee fighter Dremora for 60 seconds. The Conjuration spell Conjure Dremora Lord will summon a Dremora Lord for 60 seconds. The Atronach Forge can be used to summon hostile Dremora. The Conjuration Ritual Spell quest involves summoning an Unbound Dremora; this Dremora cannot be summoned anywhere other than the roof of the Hall of Attainment. The Wabbajack has a chance to momentarily turn the target into a hostile Dremora. 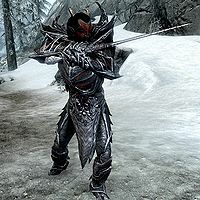 There are three types of Dremora, based on their preferred fighting style (melee fighters, archers, and warlocks). All Dremora are NPCs, which means that they have black souls. All types of Dremora have a 100% chance of dropping a Daedra Heart on death, making them one of the few guaranteed sources of this rare ingredient. They also carry an iron dagger and will drop a Daedra Heart on death. ^1This Dremora is also the template used for the Dremora Lord summoned with Conjure Dremora Lord. They also carry an iron dagger, one iron arrow, and a quiver of up to 20 iron, steel, orcish, dwarven, or elven arrows, depending on their level. 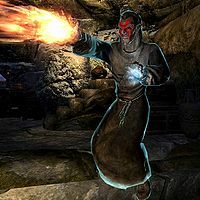 Dremora warlocks are members of the Destruction Mage NPC class and prefer to use spells in combat. They wear unique black robes and boots. In case they are forced into melee combat, they carry an iron dagger and a mace, sword, war axe, warhammer, greatsword, or battleaxe (any quality from iron to elven). A Dremora Lord can be summoned using Conjure Dremora Lord, an Expert level Conjuration spell. 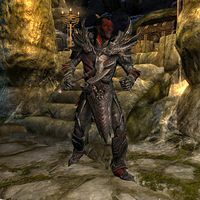 The Dremora Lord is a melee fighter equipped with the standard unique Daedric armor, and wields a Daedric Greatsword of the Inferno. The Dremora Lord has 345 health and 230 stamina. Dragon Priests cannot take control of conjured Dremora Lords. Furthermore, while the Dremora Lord is technically not an Atronach, it is affected by the Summoner and Atromancy Conjuration perks, although it is not affected by Elemental Potency. The Twin Souls perk also applies to Dremora Lords, making it possible to have both a Dremora Lord and an atronach or thrall, or two Dremora Lords. Unlike other types of Dremora, Dremora Lords cannot be pickpocketed for weapons or armor, and they will not drop Daedra Hearts because their bodies disappear upon death. They are also immune to Soul Trap. "I will feast on your heart." "I honor my lord by destroying you!" "Are you prepared for your death?" "There could be no other end." "You meet your end, mortal." "Hiding will not save you now." Game data reveals that a part of the Dremora is copied from the Dark Elf. The Daedric Prince Sanguine appears in the form of a Dremora. Several NPCs are classified in the game data as Dremora. Strangely, some Dremora, either through natural spawning or use of the console, do not use the regular Dremora voice type, but instead sound like male Nords. Seven of the Dremora lines appear in the book I Was Summoned by a Mortal in ESO. For more information on Dremora in the Elder Scrolls universe, see the lore article. This page was last modified on 17 March 2019, at 19:35.